Extreme Arizona provides you with everything you need to have an awesome adventure. We are located in Cave Creek, Arizona just north of Phoenix. We specialize in ATV Rentals and Dirt Bike Rentals. We also offer multi-passenger UTV rentals such as the Polaris RZR. 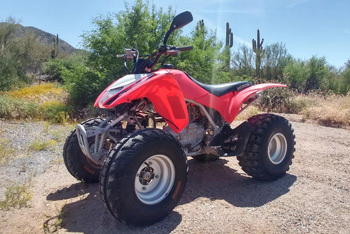 Our ATV and Dirt Bike rentals are offered seven days a week. Your fun can last for a half-day, full-day, or rent them for multiple days. There are miles of riding trails available in Arizona. Friendly for all ages our Polaris RZRs are the perfect choice for a family day of fun, while experiencing all the desert has to offer. Extreme Arizona can help you create your next adventure. As Arizona's premier off-road rental company, we'll outfit you with all of the motorsport gear you need for an unforgettable desert experience. Make Extreme Arizona your RZR rental choice today. 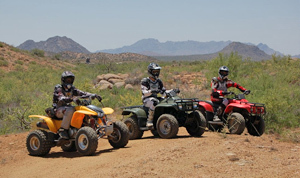 If everybody wants to drive, we also offer single-passenger ATV rentals or dirt bike rentals. Our Polaris RZR rentals are offered seven days a week. There are miles of riding trails available in Arizona. If you are local to the Phoenix area, Pick up your vehicles and head to your favorite riding spots. If you are a guest from out-of-town you may take advantage of our Tow and Trailer Package. If you don't have riding gear, don't worry about that either. We have that for you as well. Off Road Adventures are the name of the game here at Extreme Arizona motorsport adventure tours. We can provide a guided tour or rent you the motor sport equipment and let Tonto National Forest do the rest. Just make a reservation, stop at our shop, and we will get you ready with the rest; including maps of the local riding area where the trails are all clearly marked for your riding pleasure. We ask that you respect the land and all the living creatures that make their home in the desert. Please stay on the trails and only ride on the trails that are appropriate for your chosen vehicle. 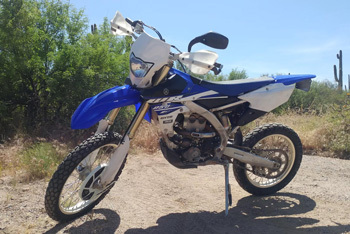 The Yamaha WR250 is a full sized dirt bike with a wide ratio transmission ideal for desert riding. It features an electric start as well as a kick start, long travel suspension, disc brakes and race inspired ergonomics. The WR series have evolved from the YZ motocross bikes to make them better suited for woods and desert riding. 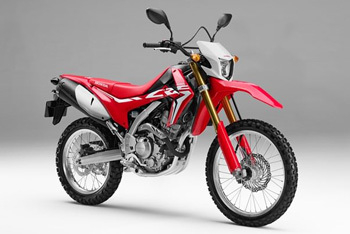 The Honda CRF250L is a Dual-sport, fuel-injected DOHC single-cylinder counterbalanced engine, and electric starter with a comfortable, neutral seating position, headlight, taillight, mirrors. Motorcycle endorsement is required if motorcycle is ridden on the public roads. Rental times may vary depending on time of year. Waist pack with a few bottles of water if needed. Our rentals NO LONGER REQUIRE THAT THEY BE TRAILERED!!! We are fully street legal as of this minute! You can ride directly to the trails, on the road, like you do in your car, about 7 miles from our office location!!! Light enough for smaller adults, big enough for full-sized riders, and with a powerband you may never outgrow. And since we all know Hondas last just about forever, that’s a good thing. New riders get to learn clutch control without worrying about stalling, while experienced riders get all the control and freedom to shift they normally would. ATV rental includes, helmet, goggles, gloves and waist pack with water. 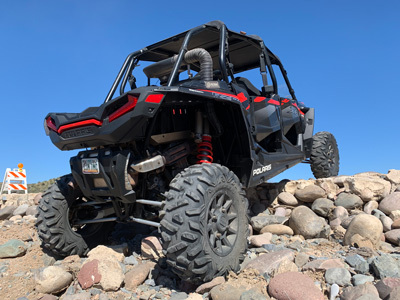 The Polaris RZR-4 800 is a four passenger off road vehicle that can be driven on the roads in Arizona. While we limit how far they can be driven on the road, they can be driven right from the shop to the closest trail system, which is just 10 minutes away. The Polaris RZR-4 800 Electronic Power Steering is equipped with a 4-stroke twin cylinder engine with a displacement of 760 cc. The engine features Electronic Fuel Injection and is mated on an automatic PVT transmission. 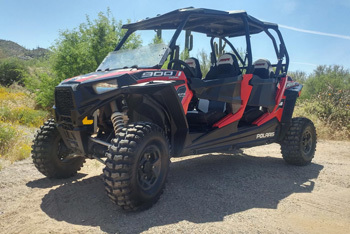 The RZR-4 900 is a wide 4-seat, side-by-side with all top of the line features. While our shop is located in the historic town of Cave Creek, the nearest riding trails are located 7 mile east in the Tonto National Forest. All of our single passenger and some of our mulit-passenger vehicles do need to be transported to the riding trails. Extreme Arizona can provide you with tow vehicles, trailers and all the safety equipment you need to ensure an exciting and safe off-road adventure.